Melt 1 1/2 sticks of butter. I place the dish right on the stove and melt it. Place enough pretzels to cover the bottom of the pan. Sprinkle with 3 T sugar. Bake for 10 minutes. Cool. Soften 8 ounces cream cheese. Mix in 1/2 C sugar. Add 1 tub Cool Whip. I prefer real whipped cream. I was out of whipped cream and a quick run to the gas station resulted in using the Cool Whip. Spread mixture over cooled pretzels. 1 package of frozen strawberries. Take 6 ounces of strawberry jello and add 2 C boiling water. Mix until all jello is dissolved. Add 1 C cold water and stir. When the strawberries are still partially frozen chop them into bite sized pieces. Add berries to the jello. Pour gently over top of the cream cheese mix. Refrigerate. the measurements are a good guess at best. 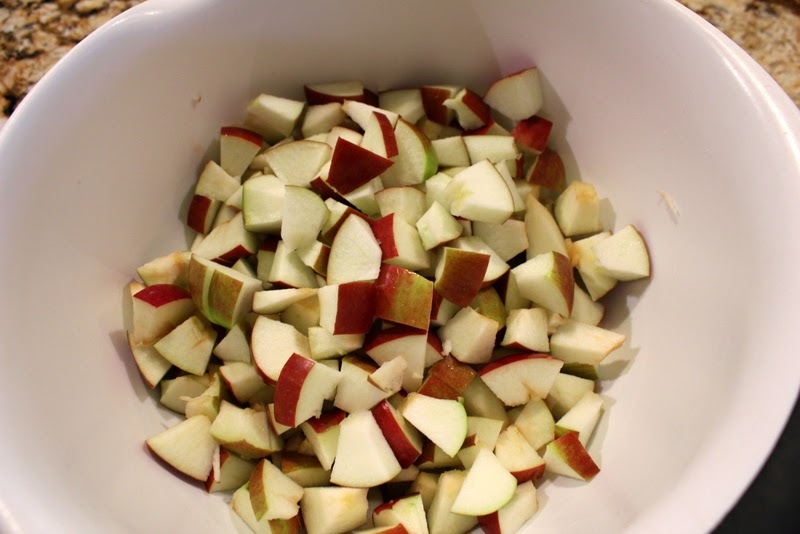 Wash and dry 5 or 6 apples. I prefer tart apples. 1/4 C honey. I just scooped, and squeezed until it looked right.